Valencia Chan has owned and operated Angel Light Books and Gifts since 1989. 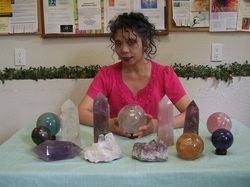 An avid metaphysician, she has studied in depth topics including astrology, tarot, chakras, crystals and feng shui. She received her certification in astrology in 1987 from Experience Astrology in San Francisco and for Feng Shui in 1996 from Feng Shui Design in Grass Valley. Being Chinese, feng shui has always been an intergral part of her culture. Her knowledge of crystals included attending workshops from various teachers, studying from an extensive library of books and most of all from her personal experience of selling and giving away thousands of stones over the years. “I’m always amazed at how the perfect stone will find its way to the person who would most benefit from its power.” She also the author and creator of the Crystal Wisdom Cards now available through our online store. Immerse yourself in the mystical, magical world of crystals. Uncover the power of window crystals, time link crystals, record keepers, Isis crystals and more. Apply quartz for crystal gazing, astral travel, meditation and channeling. Learn how to choose, clear and program a crystal to bring manifestation into your life. Step into the enchanting world of lapis, malachite, carnelian and more. Discover how they can balance your chakras to bring harmony into your life. Determine the benefits of clusters, generators, pyramids and wands. Learn how to make gem essence for healing and well- being. Chakras are subtle energy centers in the body that influences one's body, mind and spirit. Learn about the function, anatomy, element, color and stones associated with each chakra and how to balance them to bring optimal well-being. Complete 3 classes--Stones Awareness, Crystal Awareness, and Chakra Awareness, answer questionaire and recieve a certification from the Angel Light School of Metaphysics. The Rider Waite is the most popular and recognizable deck in the world. It's rich in symbloism. Learn its meaning to give powerful, insightful readings for yourself and others. Your birth chart is your blueprint to your life. There are no two alike. Like a snowflake each is unique and unrepeatable. Learn about the signs, planets, houses, and aspects. Discover more about yourself and others through the study of astrology. Eloise Hill is a nurse, psychic, and writer who has been in love with the Tarot since she picked up her first Rider-Waite deck at the age of eighteen. She worked in acute care nursing for thirteen years before deciding to pursue a career in writing and all things intuitive. She is the author of the Eileen McGrath Tarot mystery series and has over 30 years experience as a clairvoyant, clairsentient, clairaudient. In addition to doing private intuitive/Tarot/Rune readings, she hosts the monthly Psychic Tarot Faire at Angel Light Books & Gifts, particpates in the monthly Metaphysical Faire, and teaches classes on a variety of subjects. An introduction to the pictographs utilized by the ancient Germanic/Nordic tribes of Europe. Learn the alphabet, pronunciation, symbols and meanings hidden in the Elder Futhark Runes and their divinatory uses. Practical & Magical Rune Applications – an introduction to Norse lore/mythology and the practical uses of the Elder Futhark Runes. Learn how to customize your own runescripts, bindrunes, and talismans. The use of candles as sources of light and inspiration is not limited to any given spiritual practice. Learn candle magic basics and how to apply color, scent, and symbol to direct your focus, empower your intention and manifest your dreams. Still looking for your pot of gold? Learn five simple techniques for identifying your prosperity blueprint, banishing scarcity conciousness and attracting abundance. What secrets lie at the bottom of your cup? Learn the history of this domestic art as well as the best cup types, swirling methods, symbols and meanings. Learn to read Aleister Crowley’s magical deck in six weeks! This weekly class includes: history of the Tarot; significance of the Major Arcana, Minor Arcana, Royalty Cards, Aces; and basic meanings of all 78 cards. Includes Angel Light certification at completion of the course. Time to heat up your love/social life? Learn three tried-and-true techniques for clearing old attachments and attracting relationships that are your best energetic match. Evelyn Mazza is an advocate for spiritual development, earth magic, & self love. As a practicing psychic medium, psychometry reader, healer, angel card reader, she conducts classes every 3rd Saturday of the month at Angel Light Bookstore. She offers mini psychic/past life readings on the 1st Saturday of the month as well as private readings. She has helped many people connect with their higher consciousness. Understanding the different fairies & myths, their elements & how to increase your intuitive psychic abilities. Topics include gems/stones, herbs & a guided meditation. Gather information to connect with nature spirits & learn about the green magical path. Fun magical class! Journey into the outer/middle/lower realm to find your animal spirit guides. Discover your animal totem as a rite of passage to find your true self. Seeing repeated signs of animals is a form of divination. There are different meanings behind different animals. Learn to understand the themes of various animals to gain insight into your life. Helena Mazzariello is an artist, a gardener, and a clairvoyant who has been doings readings for 30 years. Her training at the Berkeley Psychic Institute includes the two-year intensive clairvoyant training program, as well as graduate programs, including a Ministers program. Besides her own clients, she teaches and co-teaches many workshops, classes and teleclasses. She has been reading auras at the Whole Life Expo for years, as well as participating in the monthly fairs at Angel Light Books, including the Metaphysical Fair and the Angel Fair, which she co-hosts. Angel Light also puts out a delightful newsletter! She has taught Goddess workshops, emotive movement workshops, tarot, Ascension and the 7 Rays, Violet Flame, Chakra Meditation, Working With the Archangels, Psychic Toolbox, Manifesting and Miracles and the Basic Meditation Circles. For more information of classes that she teaches, please visit the Angel Light School of Metaphysics. Treat yourself to a night of meditation and healing as you learn to work with Archangels and Ascended Masters. This two-hour class gives you an amazing array of spirit tools for your magical toolbox, as you learn to clean and clear your space, and have fun doing it! It is also a hands-on class, as we do healing work each session. This is a continuation of Meditation Circle, with more advanced healing techniques, training in psychic readings and healings, and spirit training. Prerequisite: Beginning circle or similar training in the energy arts. We’ll learn the history of different kinds of labyrinths and their purposes, and view many labyrinths of history, and present time. We will learn the formulae to building one or two different types of these amazing meditations in the body, and will create them on paper. There will of course, be a walk to a labyrinth! This is a basic class in ascension, studying the 7 Rays, their meanings, and the Ascended Masters, Archangels, and Elohim within them. We will spend time on each Ray, doing meditations and healing work. This work is profound—expect miracles. Can you say Laws of Attraction?! This class is all about creating and manifesting mockups, and miracles in your life, and having a lot of fun while doing it! Many different types of techniques to create your life will be explored and enjoyed! All classes (except Manifesting and Miracles!!) have certification in both Angel Light School of Metaphysics, and Spirit In Joy! Readings, classes and coaching help align thought, emotion and action and bridges the gap between spirituality and physicality. 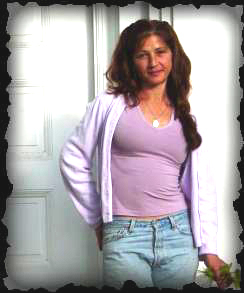 Cinthia's readings, classes and coachings have depth, compassion and humor--making work feel light. Cinthia teaches classes on intuition including Intuitive Handwriting, Intuitive Decluttering, Intuition101, Psychometry, Shortcut Tarot, Guidance from your Spirit Guides and the Vision Board Class. She also teaches a 3 week Dreamwork Course. For more information of the classes listed, please visit the Angel Light School of Metaphysics. Ryan is a Nutritionist, Herbalist, Aromatherapist, Acupressurist, Angel Therapy Practitioner certified by Doreen Virtue and Clairvoyant. She underwent two years of formal education in Ayurvedic Medicine and completed 500 hours of training as an Acupressurist. She achieved certification in Aromatherapy and distills her own essential oils. Ryan earned her BA in Comparative Religion and Women’s Studies, and upon graduation served as a Unitarian Universalist Youth Minister. She is a Spiritual Counselor having completed the Clairvoyant Program with the Church of Divine Man and is currently undergoing training as an Interfaith Minister. Since early childhood, Ryan has been able to see, hear, and feel energy. She simply calls it “having extra senses or being able to sense spirit,” and brings these natural skills to her psychic readings. Ryan teaches classes on communicating with the angels, developing your psychic abilities and the energy anatomy. In this 4 class course, Ryan combines her angel communication skills with her psychic tools and teaches the participants how to receive guidance for themselves and others. Cerification from the Angel Light School of Metaphysics upon completion. For more information of her class please visit the Angel Light School of Metaphysics.